The tomb of Cecil Talbot is Grade II listed monument and dates from 1720 and is a good quality and early chest tomb. Cecil Talbot lived from 1692/3 to 1720 and was the daughter and heir of Charles Matthews of Castell-y-Mynach, Glamorgan, and also heir presumptive of her uncle Richard Jenkins of Hensol, in the same county. In 1708 she married Charles Talbot (1685-1737), a lawyer, and the son of William Talbot, successively bishop of Oxford, Salisbury and Durham. The couple had five sons. The second of these, William (1710-1782), became first Earl Talbot and Lord Steward in 1761; his monument is in the south aisle of the church. The Talbots' connection with Sutton is not currently known; one account (A History and Description of Sutton, 1869) states that Cecil having died here, William chose to be buried with her. Charles Talbot would become Lord Chancellor in 1733. His name is remembered in the 1729 Yorke-Talbot slavery opinion, in which Sir Philip Yorke as Attorney General and Talbot as Lord Privy Seal opined that slavery was legal in England; this was widely referred to as authoritative before being superseded by the celebrated Somerset case of 1772. Following Cecil's death he inherited her Glamorgan properties, and is credited with re-building Hensol Castle; he was made first Baron Talbot of Hensol in 1733. Cecil and Charles's descendants inherited the earldom of Shrewsbury in 1858; thanks to Talbot's efforts in mobilising support for a private bill for the resettlement of the estates of a distant cousin, Charles Talbot, Duke of Shrewsbury, in 1720, they also inherited the estates. 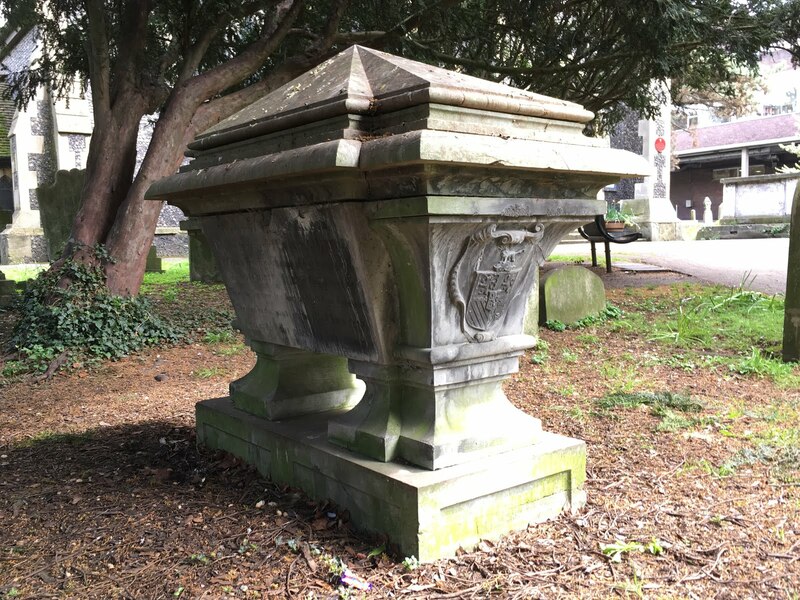 The tomb of Cecil Talbot takes the form of a sarcophagus with pedestal feet on a panelled base. The west and east ends are coved, with projecting sloping panels to the north and east, and there is a cornice with a bold oversailing torus moulding below a shallow pyramidal lid. The west and east ends are carved with Talbot and Matthews arms in cartouches; the projecting north and south faces carry inscriptions. There are two repairs to the stonework, one to the north and one to the south face; on the south face an inserted section of stone has been carved with lettering. 'She had a quick apprehension ready wit and solid judgement / Improved by usefull […] knowledge. Of the excellence of Virtue, She is gone to God in peace.